Our guide will pick you up from the hotel in Sharm and transfer to Sharm airport then fly to Luxor to relish visiting the Valley of Kings, Temple of Queen Hatshepsut and the impressive temples of Karnak. The Valley of the Kings where kings of the new kingdom in ancient Egypt were buried, they cut into the limestone mountains similar pattern of the pyramidal shape tomb with three corridors, antechamber & sunken sarcophagus chamber. All are well decorated and rich with colors. 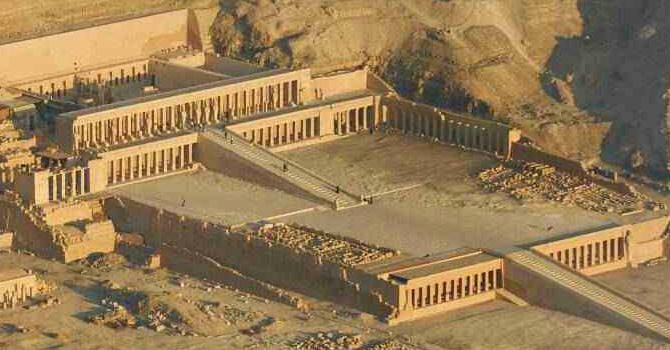 Hatshepsut Temple or the temple of Al Deir Albahary, established and devoted to the powerful queen Hatshepsut, she is the only female ruler who ascended the throne of Egypt for about 20 years, it is one of the best preserved temples in Luxor west bank. Karnak Temple although it is badly ruined but there is no site in Egypt is more magnificent than Karnak. It gives unique example of the achievement of many generations of ancient builders. Consists of 3 main temples, smaller enclosed temples & other outer temples. Luxor Temple was center of most important festivals in ancient Egypt, established by Amenhotep III and Rameses II to be as a setting for the ceremonies of reconciling the human features of the ruler with the divine office. Transfer to Luxor airport, fly to Sharm and drive back to your hotel.